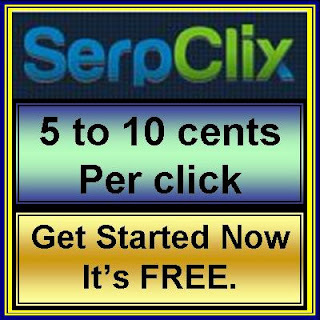 SerpClix - How it works. How to get the most out of it. How to use it and How to get the most out of it. To start working open the Firefox browser and click on the SerpClix AddOn icon (Top right corner of the screen) enter user name and password to login. This logs you into the AddOn which delivers orders. When you get an order (a blue bar across the screen with "Key words" and "url link") click on it. A new tab with a google search bar will open. Make sure that your cursor is in the search bar and then either "Right Click" and "Paste" or enter "Ctrl V" this will enter the keywords into the search bar. Click enter and start the search. When you get an order pay close attention to the url and as you scroll through the links on the Google search page look for the url as not all orders are highlighted. Once you have found the link open it and the Serpclix icon will change to a red square and a timer will start to count down. When it reaches 0 the page will automatically close and you will be returned to the orders page where you should get a green message "Success"
Download the program >>>here<<< (It is safe to download) Once downloaded open your downloads folder and find the file "pixel_change_detector" Right click on it, choose "Send to" from the menu and then "Desktop (create shortcut)"
To use it click on the icon on your desktop. On the Pop Up screen select "Run". This will activate the program and open up a new pop up with a big button "Select Pixel"
Now open the window where SerpClix is running. Click on the big button "Select Pixel"
Place your cursor either to the left or the right but in line with the message "Sorry there are no orders available at this time. ..." and left click. This activates the program and when an order comes through an alert will sound. You can only use Pixel Change Detector when the SerpClix window is in focus (on top). If you want to open a new window you must "Stop detecting" or the alert will sound when you open the new window.